I meet with Judith Sinnamon at her Balmoral Ridge home, set into the rainforest – cathedral ceilings and windows that open to the world which is really what you might expect of an artist who is renowned for painting big beautiful trees. The predominant colour in Judith’s paintings is not, though, the emerald green of lush rainforest for she is, I discover, drawn to a more limited, refined, almost austere palette of muted colours evocative of coastal wallum or outback Queensland which reflect perfectly the world she paints. When I first enter her ‘studio’ which is actually her kitchen/dining room – she tells me later that she pretty much takes over the whole house with branches and bark, leaves and flowers, suspending them so she can look up into them as if she was beneath a tree – I am confronted by a very big canvas upon which is a most magnificent yellow background and I recall that in a video she said she didn’t like to paint on a blank white canvas as it felt too daunting! I ask Judith if she mixes this glorious golden colour herself. She does although it’s not an exact science and it does change from painting to painting but yellow is the key behind the light in her paintings. Judith has such a passion about painting and her development as an artist. She loves the lusciousness and expressiveness and beauty of oil paint and having fun with the actual painting of the subject, whether it is a tree or a person. But first I wanted to find out how she came to this place – painting full time. Judith finished art school in 1984 when painting wasn’t in vogue (she holds a diploma in Fine Art majoring in Painting from Griffith University and a degree in Education). She travelled overseas and self-educated in European and London art galleries and waitressed and worked in book shops, then came back to Australia and knew she needed a real job and got a Bachelor of Education and became a teacher and ended up in Special Education. Eventually she returned to where she started – painting. Judith is also a full-time mother so she fits her painting around her family. Typically she starts her day around 10.00am and it was nice to hear she is a procrastinator. For I am in that category! We could be twins. But of course not! Once Judith gets started she loses herself in the painting, gets into a zone where she is completely immersed. Stopping and starting doesn’t work very well because she is working with wet on wet. And she will also paint at the end of the day after her family has been fed and they are settled for the evening. She will try to get to bed by midnight (this must be the key for I find myself wanting to go to bed when the sun goes down! Nothing achieved at night-time at all…). To enable her to paint late, she sets up big studio lights. I learn that there are two ways in which Judith paints – from real life (bringing foliage inside, and suspending and arranging) or from images that capture a fleeting moment of light, generally early morning where the first rays catch the uppermost branches. This latter technique has been enabled by the technology of the laptop screen where colour, clarity and detail is far superior to a flat paper photographic image. Judith projects the image onto the canvas and then scrapes through the thin base colour to make a kind of rough outline as her guide. This enables Judith to paint in an intuitive way, capturing colour and light. She said it can take many photos before she gets the one that perfectly suits what she is wanting to paint. Because the light is so important in her paintings – it is in fact as important a protagonist as the subject itself – painting en plein air is difficult. The light moves too quickly, changing what she is trying to put on canvas so photographing gives her the precise image she is after. She tells me the Dutch painter, Johannes Vermeer, did the same thing with a camera obscura. And I look this up to find out that David Hockney published a book about Vermeer using optics so Judith is following in large footsteps indeed. The intricate detail of leaves – the way they fit like a jigsaw and the tiny bites made by insects that are so expertly painted – intrigue me. Judith refers to this as being like wabi sabi, the Japanese term which means “a way of living that focuses on finding beauty within the imperfections of life and accepting peacefully the natural cycle of growth and decay.” And there is something perfectly fitting about this. We live in a world which defines ‘wholeness’ as being complete and unflawed (think of our supermarket fruit and veg for instance) so to find this kind of unashamed detail of decay is refreshing. Although Judith is not an abstract painter, her bark painting is both abstract and real. If you spend time looking at bark, you become aware it is very abstract in its colour and detail. I feel that if I touched a piece of Judith’s bark painting, I would actually feel the rough papery texture beneath my fingers. It is painted so deftly, so precisely it is almost like a photograph. I ask her about painters who have influenced her and she refers again to Vermeer and also to Van Gogh and the Australian painters, Margaret Preston and Albert Namatjira among many others. She loves what they achieved with colour and texture and of course light. Judith combines her passion of painting with her passion for the natural environment. 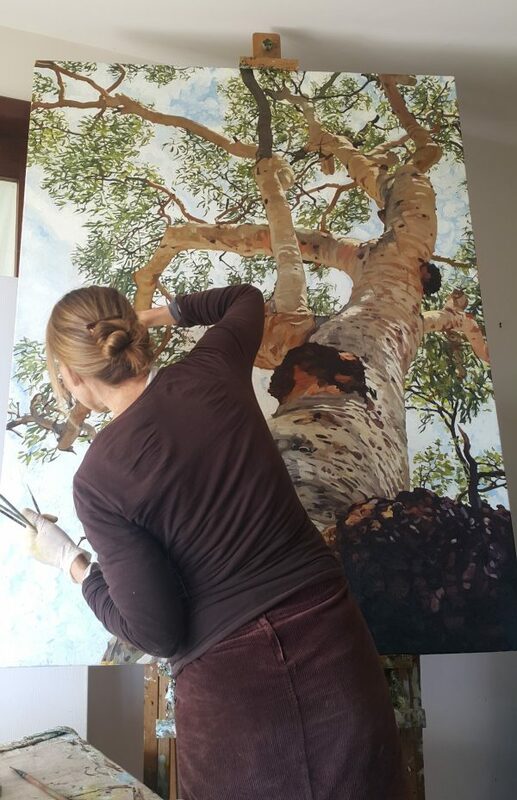 She is deeply concerned about the loss of habitat due to land clearing and the increasing stresses of a warming planet on the flora and fauna of our land, both coastal and outback, and by painting as she does, she is documenting this loss which comes about through development and over development. A somewhat whimsical touch are the little birds you will find hidden among the leaves – a kingfisher or a little Willy Wagtail or a Rufous Whistler. Having talked about her huge natural studies, she shows me some beautiful still lifes. One in particular that I was taken aback by included seersucker – that little plain Jane piece of material once adored by 1950s homemakers – which under Judith’s brush almost becomes the lead character in her painting. It is stunningly realistic, full of texture and colour. “The peaks and troughs of seersucker are really like painting a landscape of mountain ranges with the extra complication of the intricate criss-crossing of the plaid pattern – a real challenge!” Judith loves the challenge that different textures present and attempts to render them to reality through the fluid medium of paint. In 2015 she and her family went to live in Yangon (Rangoon) where her husband worked with the Yangon Heritage Trust to help in the preservation of old buildings and Judith set up her studio and painted what she could see from her apartment or in the streets around their temporary home. As here, she looked up towards the sky and incorporated into this view modern living accoutrements like electricity wires and Sky scanners as well as the crumbling architecture and trees that grow out of the cracks of buildings. A more drastic change from the tranquil leafy surrounds of Balmoral Ridge to the 6 million plus of bustling downtown Yangon could not be imagined! Here she began to really use photography to capture colour and light. The glass windows and the special light that reflected off the bricks gave so many challenges so she was ably guided by her photographs. And here it was she came to paint beautiful portraiture. Looking down from the family’s 7th floor apartment she heard the lovely sing song voices of the local hawker women and became intrigued by them. Via an interpreter, Judith arranged for some of the women to sit for her for payment. These women who carry, on their heads, fish and great piles of eggs, baskets of fresh flowers and brooms, held in the twist of a longyi (which is a man’s sarong and yes, I did write ‘brooms’) are given the grace and elegance that Judith saw in them. They look out at the viewer proudly, beneath their heavy loads which they carry every day, these loads that help feed their families, keep a roof over their heads. The women she painted were very appreciative of the paintings because they felt they were very true to life and that Judith had caught them precisely. She did not attempt to make them exotic for the sake of exoticism. And this too is a form of documentation because slowly these old ways of life in South East Asia are being lost. Judith has been fortunate to be represented by the Edwina Corlette Gallery in Brisbane for eight years and each year she has had an exhibition which nearly always sells out. This year she held an exhibition of work she made about the Bimblebox Nature Reserve which is in the South Galilee Basin, beyond Emerald and Alpha [if the Adani mine and others go ahead this reserve will be dug up.] Bimblebox, which trips off the tongue, is also the name of a tree. She found she was ‘unprepared for the beauty of the place…’ and she painted the landscape there because she wants ‘people to value nature… Trees are loved because their beauty is comforting, however nature is not a given. We can’t know that it’s going to be there forever, unchanged.’ Perhaps this is why people have her large canvasses on their walls, as a reminder to everyone that we need trees, we need those amazing inspiring landscapes. I left Judith’s studio with these words in my head: I believe anyone can paint. I was buzzing with excitement, that electrifying feeling that you have when you have just spent a couple of hours in the company of someone who is passionate and open and abundant with joie de vivre. I went straight home and opened up my little tin paint box and immediately knew I was kidding myself. But then again, she pointed out that practice is key, improving all the time through dedication and practice and trying things you normally wouldn’t. So practice I will, late into the night….. If you would like to buy a Bimblebox 2019 Calendar here is the link –https://bimblebox.org/2019-bimblebox-nature-refuge-calendar/ . For me, this is likely to be the only way I will be able to afford a Judith Sinnamon piece! At $20 it is a snap! And don’t forget to look out for the little bird she has hidden in the leaves. Interesting fact (among many) – Judith paints in the house with a hat on to cut out the side light because the studio is very light.